← Making SMART-er Goals for 2013! We are only five days into the year, and so far, the sailing has not been entirely smooth. Nothing horrendous, but just a lot of little things that start to add up. I felt a bit unsettled and keeping my sunny disposition became a bit more difficult. Then I hit a deer on my way home. It was during rush hour, on a Parkway with no street lights. The only thing I saw was the hind legs of a deer before I heard it clip the front of my car…hard. Luckily I was okay, my car sustained some damage, but nothing fell off! Everything will eventually be fixed and this is why I pay so much for have insurance (my second visit in 2.5 months…both due to something nature related…I wonder if that means anything). Although, I can’t say the same for the deer. I have no idea what happened to him. Hopefully he is hobbling around the woods? As startling and peeved I was over this incident, it kind of served as a shock to the system. After that night, everything started turning around for the better. And so far, so good. So good in fact, I am now back in the kitchen! I took a bit of a break from baking these past couple of weeks. However, when your boss heavily hints that I should feel free to bring in cookies to the office, I guess that means I should oblige! I do have a co-worker who cannot eat gluten, so that got me thinking about some gluten free options. However, I do not have a gluten free kitchen, especially not a gluten free mixer (there is flour all over that thing). But I thought I’d try anyway. 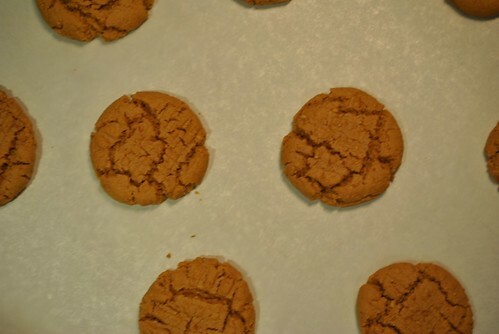 I found a recipe for Flour-less Peanut Butter Cookies from Joythebaker.com. The recipe is super duper easy and only required four ingredients. However, my only beef with this recipe is the amount of sugar it calls for. A whole cup for a yield of two dozen cookies is a bit much. But, in the name of scientific experimentation, I had to make them as is first. I used natural peanut butter. Stew Leonard’s makes a lot of great store brand items, except their natural peanut butter, which was a complete fail in my book. 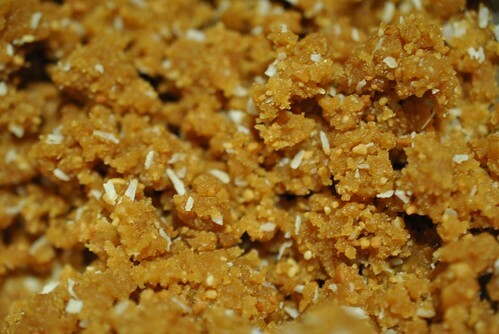 Once it hits the fridge, it becomes hard and clumpy. Not sandwich material. However, it worked out really well for these cookies. I followed her recipe and used a half cup (not packed) brown sugar and half cup of white. There has to be a way to cut that down. I made one tray of the regular peanut butter cookies, and for the second tray, I mixed in a handful of unsweetened coconut flakes (still on my coconut kick!). The unsweetened coconut flakes made the batter a bit looser, so I had to give each ball a good squeeze (ball of cookie batter!…oh who am I kidding…giggle all you want, cause I am..) before dropping them on the sheet so it would stay together better. 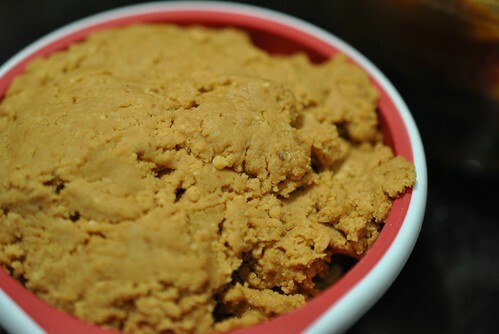 In the bowl of your mixer, with the paddle attachment put 1 cup of natural peanut butter (double check that the ingredient list says only peanuts…no sugar) plus 1/2 cup loosely packed brown sugar and 1/2 cup of white sugar. Turn on the mixer on medium low until the mixture looks combined. Add in 1 egg and let it mix till combined. Add 1 teaspoon baking soda and about a 1/4 cup of unsweetened coconut flakes and turn it up to medium speed and let it mix until it looks like a smoother batter. Scoop out and roll about walnut sized balls and place on a parchment paper lined baking sheet. Cross hatch each cookie with a fork and bake in a 350 degF oven for 10 minutes. They will look kind of under done, but after a couple of minutes on the baking sheet, they will solidify enough to be moved to a cooling rack. 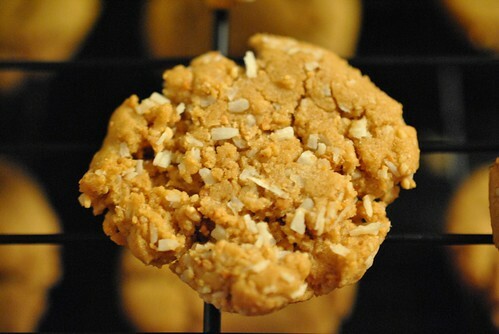 The regular peanut butter cookies are way too sweet, however the addition of the coconut flakes really helped temper the sweetness. The combination of coconut and peanut butter is actually pretty good. I actually really liked eating those cookies over the regular peanut butter ones. 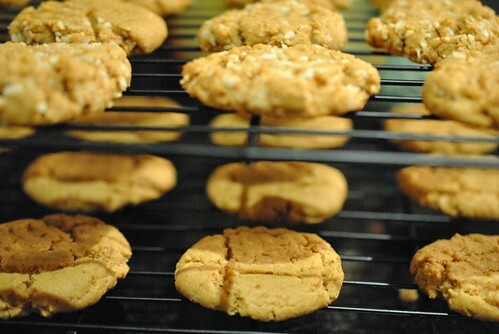 Without the flour, these cookies still hold together really well, but are just a touch more crumbly the cooler they get. Not office worthy yet, but I will have to give these another whirl with maybe more coconut and less sugar. And what about chocolate? Oh the possibilities! 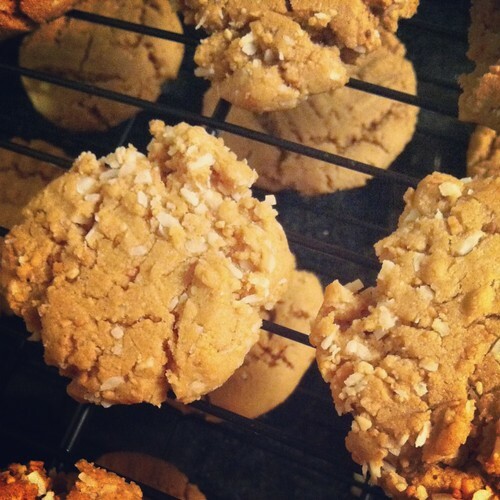 This entry was posted in Cookies and tagged Coconut, cookies, Gluten free, Peanut butter. Bookmark the permalink. Ooh… I’m sorry to hear about your accident, but I’m glad you’re safe! Sam’s hit a deer before when he used to go to Alfred University. He wound up going back and taking some of the deer meat since he knew it was fresh… Cooked it up and served it to his friends. Sam’s a weirdo. Deer are menaces to the driving society.